This past Monday, Boston received over a foot of snow. The City of Boston canceled school and closed libraries but a Snow Emergency or Parking Ban was not declared. So the question of whether to space save or not to space save was circulating on social media. Judging by the space savers in the neighborhood post-storm – it’s clear that people are feeling territorial about their parking spots. Now before the anti-space saving crowd jump all over me about writing “their parking spots,” let me explain. Some residents spent hours shoveling on Monday. They took the time to dig out their cars and carefully cleared out a spot. 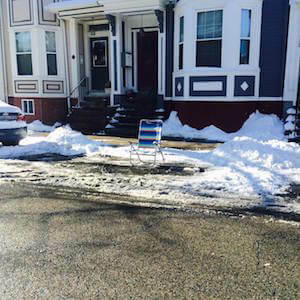 Granted, a Snow Emergency was not issued so therefore – technically we are not supposed to use space savers according to Mayor Walsh and the City of Boston. But people are breaking the “rules” and using them anyway because they toiled (yes, toiled) shoveling out their car and they left the spot so clear of snow, you can see the asphalt. Now, the jabroni with the big pick up truck who just plowed out of his spot without shoveling at all, ends up in the spot you shoveled out and you are left with his spot. Now you have to shovel again – except the snow has hardened into an iceberg. If your neighbors are using space savers, your hands are tied. You’re screwed without one. If the mayor does not want you to use space savers because a Snow Emergency was not issued, then enforcement is key. If he states that during trash pick up, the space savers will be removed, then they need to be consistently removed. We are only human and it’s natural to be pissed if someone takes your spot but if the City of Boston has removed them, well, then you need to get over it. You don’t want to be the only jerk on the block that has a spot saver out but you also don’t want to be the only jerk without one. Until we come up with a better system of snow removal involving cars, space saving is always going to be an issue. With piles of snow at the corners of intersections and snow mounds between cars, it makes parking spots a hot commodity. Luckily it’s March and spring is almost here.